From my previous post, I headed back to Holiday Inn Melaka for a short and cool weekend getaway recently. This post, I am going to entice everyone with my little Italian affair with Sirocco Restaurant at the hotel. My previous dining experience at Sirocco not only left me impress but I had recommended it to a few people and they too agreed that they love the Italian cuisine served at Sirocco. The restaurant serves up a lovely and authentic Italian menu filled with appetizer, soup, pasta, pizza, main course and dessert. Featuring an open kitchen, the ambience at Sirocco is comfortable and inviting. Dining at the restaurant, one is definitely tempted with the aroma wafting from the open kitchen even before one order. A huge chalkboard hung over the open kitchen to display the signatures and specials of the day. The table setting is simple and elegant. We started the dinner with warm house bread served with creamy butter and balsamic with olive oil. I had to stop myself from binging on the whole bread because the warm bread was so yummy. As we were dining with some other guests, we shared all the dishes. It was almost like eating a buffet that night! We had three salads to start with and I must say that they were all equally delicious in their own way. Though not an ardent fan of salads, the salads here are full of flavours and dressed to perfection. The Sirocco Caesar Salad had crisp lettuce, crunchy croutons, beef bacon, cheese and a bold cheesy and anchovy Caesar dressing while Insalata Sirocco had crisp lettuce, cucumber, bell pepper, olives, capers and strong cubes of feta cheese with a tangy dressing. My favorite of the lot was the Rucola, Parmigianno, Balsamico, Olio Extra Vergine Fruttato, a simple rocket salad with roasted bell pepper, cheese and dressed in balsamic and creamy dressing. There is something about the bitterness of the rocket with sweetness of peppers and the tangy creamy dressing that works wonder on my palate. There are 3 soups on the menu and we tried two of them. Zuppa di Funghi, Aromatizzo Altartuffoc is cream of mushrooms with truffle scent. The soup resembles bisque, thick and creamy and full of earthy mushroom flavours. My Zuppa di Conghiglie is a creamy light seafood chowder with some vegetables. I got a nice fresh piece of scallop with small pieces of seafood. Unlike most chowder, this one is medium thick and has a lovely sweet creamy note. My little one literally polished this one off by himself. Our pasta affair was a quartet one. We savored Macaroni Alfredo, Aglio Olio e Pepperacino, Penne Boscaiola and Linguine Bolognese. It’s a successful quartet if I may say so since all seems to be my favorite that night. I am particularly fond of Macaroni Alfredo as it is cheesy and creamy, executed with a fine buttery flavour of a luscious cream sauce. The lovely sprinkling of cheese on top gives the pasta a salty yummy flavour. It looks plain but flavours are just so addictive. The Aglio Olio e Pepperacino showcases the simplicity of the combination of good olive oil, garlic, chili and herbs. This one is amped up with prawns. There is a gorgeous aroma of the garlic and chili and the pasta was cooked to al dente. I would love to hog this whole plate to myself! If you like mushrooms, Penne Boscaiola is made for you. We got penne pasta smothered in a creamy mushroom sauce with herbs and cheese. The chef at Sirocco makes really great cream sauce dishes as they are so well-balanced and never overly heavy. If you prefer more classic pasta, then go for the Linguine Bolognese, a thick meat and tomato sauce. Simply choose the types of pasta and match them with the available sauces. I spied Vongole, Puttanesca, Arriabiata, Fruitti de Mare and more. And how can we forget the partner-in-crime at every Italian restaurant that serves up pasta? We had to order pizza as well since these two are simply a must when dining at an Italian restaurant. We chose Pizzicosa, Salmone and Quattro Stagioni. Pizzicosa features beef salami, olives, chili, mozzarella on tomato sauce while Quattro Stagioni has beef salami, beef bacon, chicken ham and olives on tomato sauce. Salmone has smoked salmon with sour cream which is lovely and light. The crust here is fairly thin and crisp and the topping on the pizzas are plenty, rendering a yummy bite with each one. We also tried two main courses from the menu. Certainly a mouthful, Branzino in Costa di Sale, Patate Novelle al Vapore, Burro al Limone is translated as Oven Baked Salt-Crusted Sea Bass with Steam New Potatoes and Lemon Butter Sauce. Our whole fish came buried under a huge plate of salt. We got to watch as the manager swiftly removed the salt crust and deboned the fish for us. I can smell the wondrous salty and aromatic notes of the dish. The fish is sweet with hints of salt and melts-in-the-mouth beautifully. The accompanied lemon butter sauce adds more creamy and citrusy flavours to the fish. I like this method of preparing the fish as it really showed off the ingredients full potential and flavour to the max. The dish, Pollo Allo Tartufo may look classic like a roasted chicken but it is also very well cooked. I got a tender piece of chicken with scrumptious crispy salty chicken skin and the truffle sauce is laced with a light heady aroma of earthy truffles and mushroom. What I adored at Sirocco is that the dishes here are just executed really well despite the simplicity of the dishes and ingredients. We moved on to desserts with five taking spots on our order list. We had the more popular Italian desserts and these are Tiramisu Trandizionale, Canolli, Tortino Caldo al Ciocolato, Zucotto and Affogato al Café. Tiramisu Trandizionale has the classic Savoyardi biscuits sandwiched with mascaporne cream and flavoured with Kahlua and Bailey’s Irish Cream before being dusted with cocoa. Tortino Caldo al Ciocolato is an Italian rich warm torte served with vanilla ice cream. Zucotto is an Oreo cookie mud pie. These are superb! Canolli is brandy snap wafer filled with orange cream while Affogato al Café is strong espresso shot with a dash of Drambuie served over vanilla ice cream. I prefer the Affogato for its contrasting hot and cold combination. Italian restaurants are plenty but a good and authentic one is hard to come by. If you are in Malacca and happen to have craving for Italian, you know where to head too… Sirocco! The restaurant also has plenty of wines to go with their menu. Right after dinner, we headed out for a bit of sightseeing to walk off the meal. Despite visiting Malacca several times, we have never visited two of the most famous landmarks of the historic city. We join our dinner guests and head off to Menara Taming Sari and Melaka River Cruise. 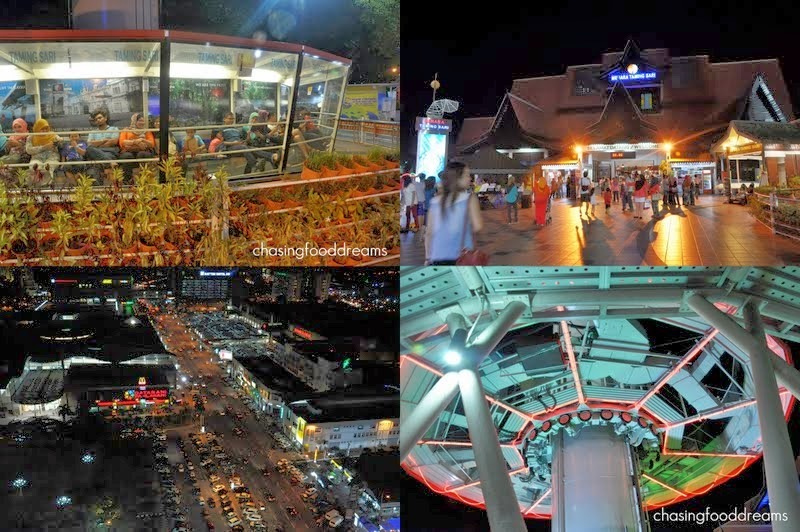 Menara Taming Sari offers a 360 degree panoramic view of the historic city. 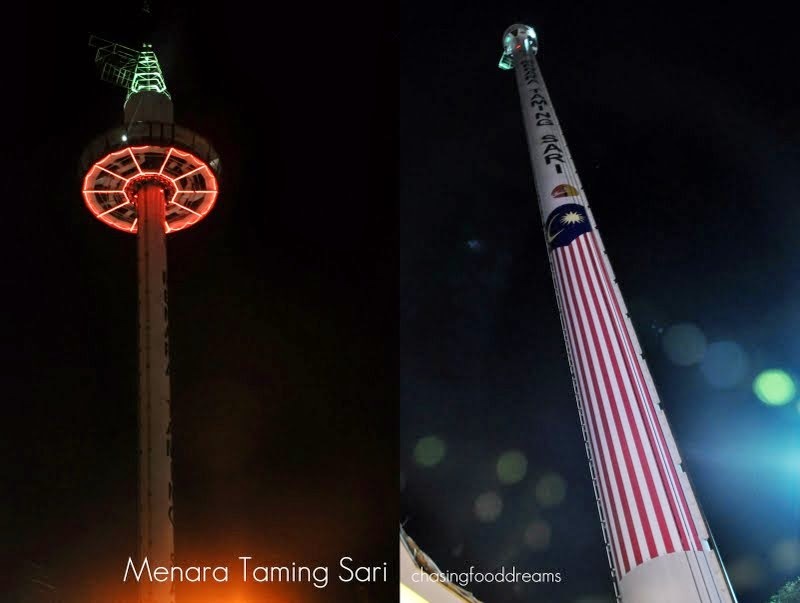 Standing at 110 meters tall, this tower was built at a staggering cost of RM24 million. The revolving tower resembles a round spaceship slowly rising high up along the pillar of the tower where guests enjoy the comfort of an enclave air-conditioned room that slowly circulate 360 degrees as it goes up. It’s a different experience during day and night as I was told. We bought our tickets and queued up for the ride. Once up there, it was certainly a sight to behold. I was truly mesmerized despite my fear of heights. Here’s some panoramic view taken with my phone! Choi Yen and her family enjoying the moment! Since the Melaka River Cruise was nearby, we walked over and took a ride on the Melaka River that cuts across the township before flowing up to the Straits of Malacca. It’s a nice 40 minutes ride that offers a view of the historic buildings and bridges now painted with lots of artistic murals. 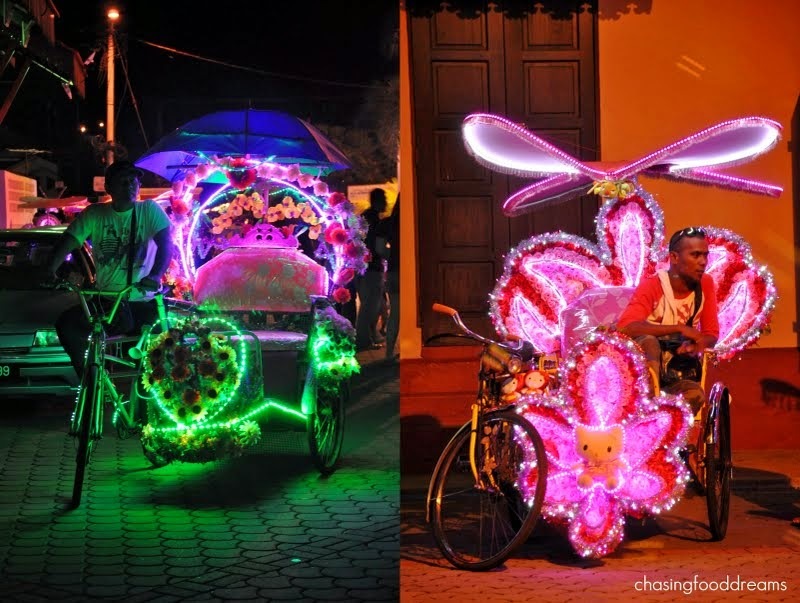 Along the way, we saw the neon lighted trishaws that seems to flood the historic city with their loud boom boxes and their flashy decorated Hello Kitty and other themes. It’s quite a funny sight to see Hello Kitty making its waves at this historic city! D was pretty ecstatic that evening because we got him a flashy bubble gun. Aglio olio looks really good.